Why Jaime Lannister doesn’t have a Neq sword for his right arm has always bugged me. @fred GOT final season, Jamie gets a dragon-glass sword-hand! What if Edward Scissorhands had been a buff cage-fighter rather than a goth/emo hairdresser? How does he get his leathers on? How does he go to the loo? Those have got to be some of the worst prosthetics ever devised – all he can do is fight. He’d need help with eating, going to the toilet, etc. @Anna T.: …and male grooming. America’s barbarous future still has hairdressers and waxing salons. @B. Chiclitz – Nice! BTW Sos’s favorite Beatles song is “All You Need is Rope”. @Bibliomancer—I guess Var’s would be “Stick Together”? @B. Chiclitz – And Neq’s would be “Carry that Sword”? @Bibliomancer—Of course. What else could it be? BTW, I like that “Florida man” stuff you were concocting with @JuanPaul. It could easily get out of hand, though, if we extend the rules and just put in “Florida” wherever we think it might be apt. 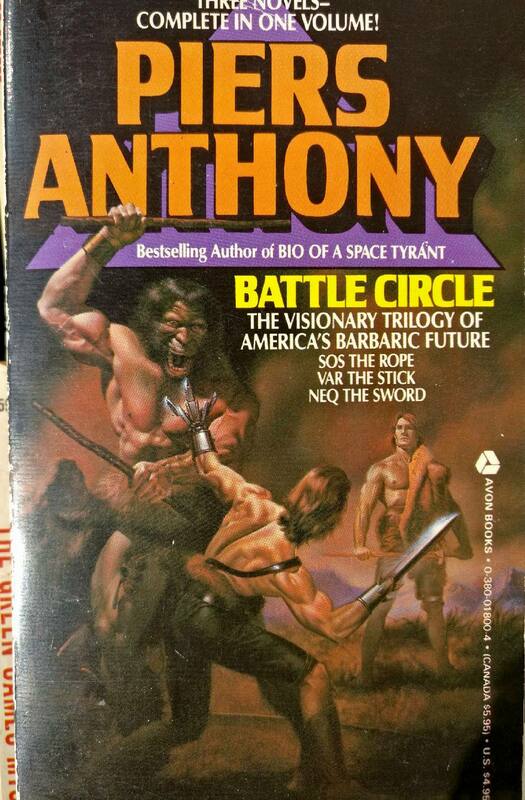 Like here, for example, Battle Circle: The Visionary Trilogy of Florida’s Barbaric Future. So this book takes place in… 2019? Hey you there. Think you could lend me a hand? Huh. Somehow this cover is less than the sum of its previous separate covers. Oh, that was just at first glance — embiggening reveals… too much. Is the foreground guy Mr. The Eggbeater? B/c backgrounder could be The Sword. And who’s Mr. The Valet for Bad Prosthetic (Florida) Man? Is that something like the old USA saying “So’s your old man!”? I get the feeling the two human guys are twins. The fighting one looks up for a second, and recognizes his long-lost brother as the ogre makes a killing blow. Tragedy ensues. Prosthetic hand twin dies and stick twin has to finish the fight for revenge, all teary-eyed because although he found his twin at last, he never got to know him. @AS – Jazz Hands? They’re not even hands !